There is no arguing that when it comes to a hot beverage, a classic hot chocolate is like receiving a warm hug in a mug. Enjoying a mug of a traditional, no fail hot chocolate has been a luxury in the colder months for as long as anyone can remember and the reason behind what makes enjoying a mug of hot chocolate so satisfying is the luxurious taste and feel that warms your whole body, paired with the thick, silky and rich taste. Even with the beverage trends continuing to change and grow, with more focus being on blended beverages and ‘health conscious’ options, Hot Chocolate has remained as one of the popular and recognised beverages on the menu. New trends and product innovation is the driving force behind keeping hot chocolate up with coffee, tea, blended beverages and smoothies. Along with adding something spicy, salty or sweet to traditional hot chocolates, the trend of enjoying a thicker, richer and less sweet chocolate is back. The Art of Blend Italian Style Hot Chocolate is created using the perfect blend of 3 premium cocoas, to create a thick, rich Italian inspired chocolate beverage. 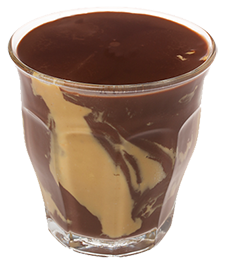 With a thicker, creamier mouth feel – the beverage itself has a desert feel towards it. Hot Chocolate is a classic beverage to be enjoyed anytime, anywhere and especially during the colder months. 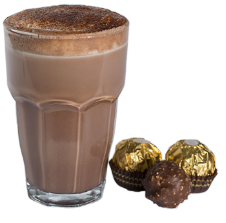 As the beverage market continues to grow so does the demand for new and innovative beverage flavours, and with chocolate as the base flavour, beverage menus are continuing to find something creative and delicious to mix it up.